Just as I wrote about the Kiddy Evoluna, this is finally another seat in which a baby can lay flat. Another huge advantage what Maxi-Cosi has, is that probably it is the type of brand that can be connected to most pushchairs – if it is a factor for you, this baby safety seat can be one of the best options for you. 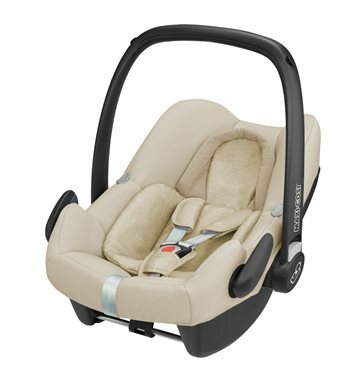 The Maxi-Cosi Rock seat + FamilyFix One i-Size base is a lightweight and safe baby seat with Isofix base on which the seat can be easily and stably mounted. Even though this seat can be used with a seatbelt, you are advised to get the FamilyFix One i-Size base to achieve maximum protection and click-and-go system by using the isofix installation. Together with the Isofix base, if you have a connection in your car, this seat is among the best solutions that you can make. The base also has visual and audible confirmation when you install the seat properly to minimize wrong installation. There are two penlights included to the base which can easily be replaced when neccessary. A signal flash switches on when the energy is below 30 percent. The anchorage of the FamilyFix One i-Size base can be used with the Rock and Pearl One i-Size car seats, this way the base is suitable for the child up to 4 years. I hope you liked this review and if you have any question about the Maxi-Cosi Rock + FamilyFix One i-Size seat or want to leave your own personal experience, leave a comment below.